Oooooh these sweet girls! I have only photographed twins a few times, so I was a touch nervous, especially since I hadn’t brought an assistant or extra set of hands with me! But the girls did amazing and slept so peacefully, only waking once to eat (at the same time!). I loved being able to snuggle with them! When I first met these parents, I felt like we clicked immediately. We met over hot drinks and ended up spending over an hour together talking and laughing. At one point, Mom said she was kind of nervous about labor to which Dad immediately let me know that she had (literally) climbed Mount Kilimanjaro! This girl is tough! 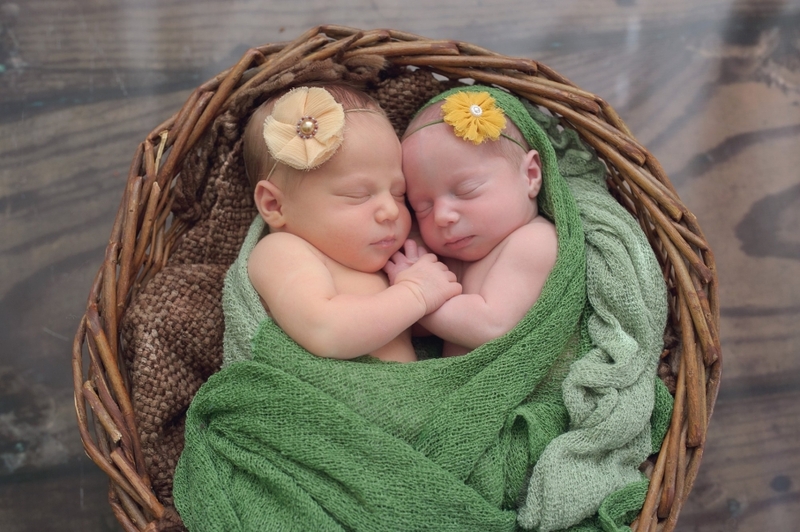 I was super happy when they hired me on the spot to photograph the birth of their twin girls. When the big day came, it started as a slow induction. We were able to chat and giggle and family came in and out to visit. 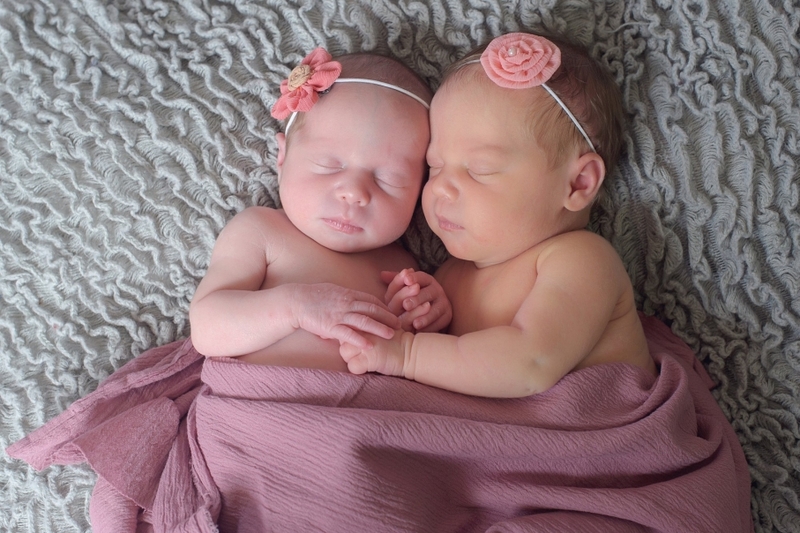 Our nurse was awesome, being a recent mom of twins herself, so she made sure to dispense good advice too. Once things got moving, they went fast. Before we knew it, we were taken down the hall to the OR for pushing (hospital policy). It was a small bright room, full of people to help with the birth (a team for each baby, anesthesia, the OB nurse and the OB himself). Pushing itself went faster than expected (hello, did I mentioned this mom was awesome?!) and soon enough, both girls were born quickly. Both girls were a fantastic size (5+ and 6+ lbs) and came out telling us all about their journey. It only took a few minutes for the parents to get to hold their precious girls. It was a beautiful birth and I was so happy to be a part of it! This was the first time I’ve ever been invited to photograph a surrogate birth. I knew it would be a giant cry-fest because I’ve been emotionally invested in this baby’s birth long before she even physically existed. I was there when her big brother was born. I was there when her mom lost two babies after that. I was there when her mom found out she was no longer able to carry her own babies. I was there when her mom told me her desire to have a baby via surrogacy. I was there when her parents announced their pregnancy via surrogacy to the world. There was no way I would have missed this birth for the world. It was over an hour away from my home, which I spent the whole way praying and celebrating. The surro mama is so physically gorgeous, but her inner beauty makes her outsides pale in comparision. She had a rough pregnancy and was a busy mother to her own cute kids. She chose to give a gift that could never be repaid and she did it with remarkable grace and beauty. This was an induction, so it started off kind of slowly. In attendance were the biological parents, the surrogate mom and her sweet husband and their awesome doula and me, of course. We had a good time joking before labor really got going. The hospital staff loved us and sent pretty much every doctor on the floor to pop in and visit. I’m sure we were quite a spectacle! The surro mom was very clear that she wanted the mom to be the first one to hold the baby and that they wanted to let the cord pulse. The sweet doctors were more than happy to deliver the baby and immediately hand her to her mother. My gorgeous friend stood there in awe of her new baby, one that she had waited on for so long. I think everyone in the room, including the staff, was in tears. It was a beautiful, powerful moment. It took a village to bring this little girl into the world and we are all so happy she is here! I’d like to add that this sweet girl’s parents named their new daughter’s middle name after her surrogate mom, who loved her and took care of her until she was ready to come out.